See Live Images As You Fly! Takes footage streamed to a display on your remote! The D-FLY Live Screen Helicopter with Gyro , is a large size remote control helicopter , approximately 16.5 inches long and 3 different colors assorted ( silver, yellow and red). It is the first RC Helicopter with Video in its category in the market that allows you to see the images live on the LCD of its controller. 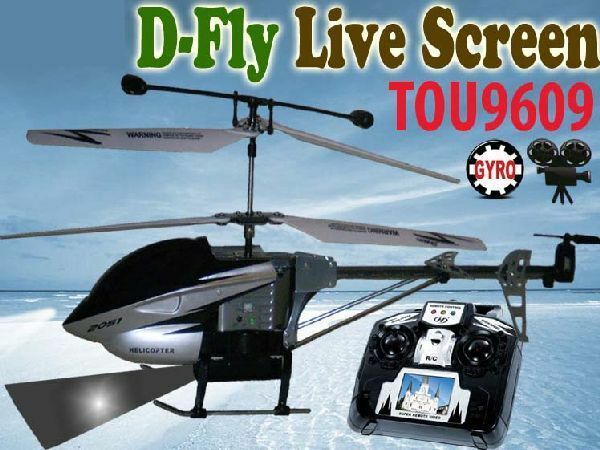 The D-FLY Live Screen Helicopter with Gyro is very easy to fly and very stable. It is a 3 channel helicopter with Gyro. It comes with 2 GB memory card included. The controller with no spring allows it to stay in the air alone for better footage. Warning : Adult supervision is required at all times.